"Obra nye woara bo" means "Life is what you make it" and it's also the title of the Mfantsiman Girls' Secondary School ode. We sang this song at Speech Days when I was a student there and this past weekend, together with class mates I had not seen since I was 15 , and alums from other classes, we sang the song together. Meanwhile copies of Powder Necklace, much of which was inspired by my experience at Mfantsiman, sat arranged on a table for sale. It was a truly surreal moment my 15 year old self never would have imagined, which is also what made the moment so cool. Back then I felt so "different" from everyone, but standing together and later jamming together on the parquet dance floor to the sounds of DJ VJay, I felt like I was with extended fam. When the MC mentioned the book to the guests in attendance--"This young lady, she's an American, a Ghanaian, sent to Ghana by her parents to attend Mfantsiman." --everyone got it. And when one of my former mates saw the cover of the book she smiled. "It's Scotton and Chinery," she remarked of the red and green uniforms reminiscent of the house uniforms we wore at school (Scotton House girls wore red; Chinery House wore green). One alum asked me "Why Powder Necklace?" Then answered the question herself. She asked me what the best thing about my Mfantsiman experience was and I think the best thing had to be the immediate understanding that everyone in that room had had their own Mfantsiman experience, and however many years later we were all in the same room singing the school ode together. 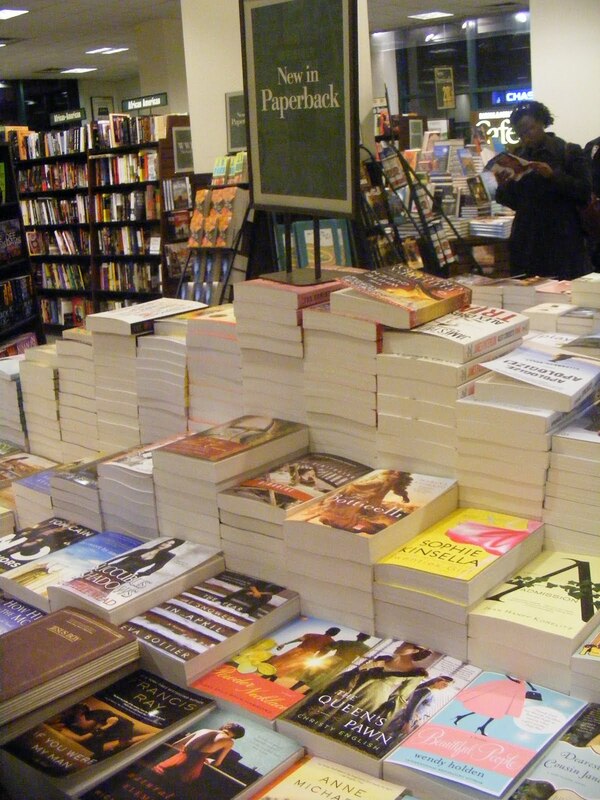 Did You Know You Could Walk Into a Bookstore & Autograph Books?! No special signing or reading necessary. My dear friend Sasha told me I could do this to make my books stand out more at the bookstore, and last weekend I tested it out!! I walked into the Columbus Circle Borders and announced myself as the author of Powder Necklace (suppressed a giggle) and asked the attendant at the Info Desk if I could sign 'em. He said, "yes!" I signed the 9 that were on display in the New Releases section (someone must've bought copy #10! :-) ) and watched as the attendant affixed "Autographed Copy" stickers on each one. I proceeded to head to the Borders across the street from Penn Station and did the same. Neither attendant checked my ID which made me wonder if I could go into another store and autograph other books as Buchi Emecheta or Janet Fitch or Zadie Smith. Anyway, the wonderment ceased when I spotted a young man and woman who looked Ghanaian. I got focused and introduced myself and it turns out they were Ghanaian! I did an on-site sales pitch for the book. Shameless, I know, but it worked! They bought it and I signed it. Don't be surprised if you find me lurking in the New Releases section at a bookstore near you. P.S. - I'll be reading and signing books on Saturday, May 1st at the Border Books in Glendale, Queens. Roll through! For those of you who couldn't make it to my first Powder Necklace reading, I hope you can make it out to one of these Powder Necklace events! "The Art of Imagination in Three Voices"
and writer of "How to Write About Africa"
My First Powder Necklace Reading! Before I get into what happened at the reading, I want to give a shout-out to my editor Malaika Adero who is also the founder of Up South, Inc, an organization committed to promoting and celebrating global storytelling traditions. I wanted to do something special to celebrate the publication of my first novel, but the truth was/is, my funds were limited, and work is busy. By planning and producing the Up South event the week of my release, Malaika took the pressure off me. For that, and so much more, I can't thank her enough! Now to the event: It was more than I ever could have hoped for. 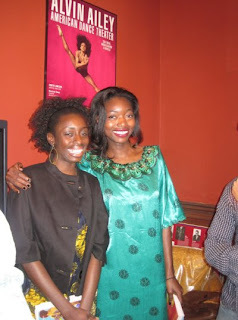 First of all, the Harlem brownstone venue was amazing -- both symbolically and literally. Harlem is where the likes of James Baldwin, James Weldon Johnson, Langston Hughes, Countee Cullen, and Zora Neale Hurston (among so many other talents) converged to make literary history as part of the Harlem Renaissance. And on a day that was a milestone in my own personal history, I was to read in an insanely beautiful brownstone with the sickest details. I'm talking intricate ceiling and crown mouldings and what looked like a hand-carved banister staircase. I couldn't have picked a better place. Secondly, the turnout! I had invited friends via Facebook and sent follow-up emails; and I was happy with the large number of RSVPs -- but on Sunday morning the texts started coming with apologies. In the end, the room was packed and spilling out onto the stoop with fam, my best girls, friends I hadn't seen in ages, former co-workers, my current co-workers, bosses, and even the CEO! A big thank you to everyone who came and wanted to come!! Thirdly, the program! 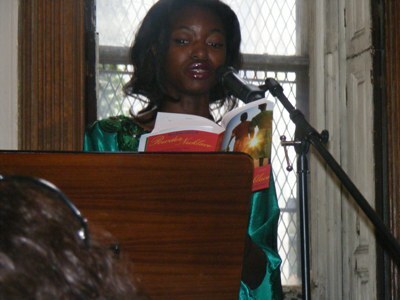 My Ghanaian sister scribe Ayesha Harruna Attah read from her book Harmattan Rain. Her book, which was shortlisted for the Commonwealth Writers' Prize, powerfully chronicles the experience of three generations of Ghanaian women making moves, breaking barriers, and seeking love amidst political upheaval and unexpected personal setbacks. Ayesha wrote this book in just nine months. In other words, she's a freaking genius. After Ayesha read, voice actor Karen Murray performed excerpts from a Ghanaian story called The Mud Cloth while pianist George Francois accompanied her with explanations of Ghanaian culture and the text. And then I was up! I was incredibly nervous for one main reason: I planned to read in my characters' respective British, Ghanaian, and American accents. Up until I got to the mic and did it I kept thinking about Baby from Dirty Dancing and "the lift". If I didn't do it, no one would know but me; but I so wanted to try. Thankfully, as I read, that anxiety fell away as I focused on just reading the story. But then I ended up crying in the middle of my reading! I wasn't expecting to crack, but as I read from the part of the book when my main character Lila first meets Brempomaa, I thought of the best friend I made at school in Ghana and was so overcome with emotion. When I finished reading, Malaika led a short Q&A and then Ayesha and I signed books and posed for pictures. I honestly don't remember much of what happened in that hour. I didn't drink a drop of the wine being served, but I was completely sotted with adrenaline and gratitude. Still am. Shout-out to Desiree Jordan and my big sis who chronicled the day with pictures; and Troy Johnson from AALBC.com who shot the video! Powder Necklace is on AfriPOP! When I was a kid, I was embarrassed to be Ghanaian/African. It was the '80s, the Ethiopian famine was in full effect on a seemingly endless evening news loop, and kids at school thought it was funny to throw the term "African booty scratcher" around. Going to Ghana changed this for me. As jarring as it was leaving all I was used to in the States, for other reasons it was a relief to be in Ghana. For the first time, my name "Nana Ekua" wasn't "different," and my dark skin wasn't a suffix for the phrase "you're pretty for a dark-skinned girl." I didn't have to explain why I didn't eat sandwiches for dinner or what language my parents were speaking. My identity as an African was no longer synonymous (in my mind or others') with poverty, disease, or head-shaking pity. On the flip side, Ghana didn't have to remain the place my parents romanticized as the birthplace of perfectly-behaved children who respect their elders without question. Ghana and its culture could exist as every other place on the planet did and does: a hustle of people pursuing happiness and peace, with all the obstacles, opportunities, and music that hustle comes with. Ghana could be mine. I get into a little of that in this interview with AfriPOP! 's Mawuse Ziegbe.Take a look. Today I walked into the Barnes & Noble on 40th & 5th and asked the woman at the info desk where I could find Powder Necklace. I practically levitated when she told me the store's copies had just arrived, waiting in the back to be shelved. I walked out into the sun and thanked God -- then I asked for that other thing I've been praying for, emboldened in my belief that it will be. 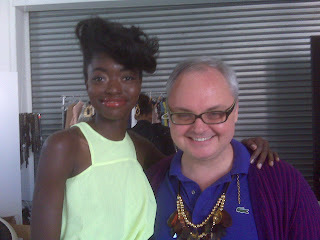 Shout-out to my girl Zandile Blay who pitched me to be part of Paper Magazine's social mediaphiles shoot! I had so much fun stunting in Zac Posen, wearing big hair and orange lipstick, meeting tres cool creatives...all while I was actually working, tweeting, and Facebooking via both my Blackberries. Hopefully I'll get a line in Paper about Powder Necklace and Bluefly where I do social media content. Who's pooped?